Dream Lover is NOW PLAYING at Arts Centre Melbourne, State Theatre, only until 4 March. No extension possible. DREAM LOVER reveals the extraordinary story of legendary singer, songwriter and actor Bobby Darin. Starring David Campbell, Marina Prior and Hannah Fredericksen as Sandra Dee, plus Martin Crewes, Marney McQueen and Rodney Dobson. Directed by Simon Phillips, the show presents great hits from the 50s and 60s including Mack The Knife, Beyond the Sea and the multi-million-seller Dream Lover. This musical captures the glamour and passion of the big band era, the Rat Pack in Vegas and the Golden Age of Hollywood – a time of trail-blazing stars, knock-out fashions and life-changing events. Featuring a sensational cast with over 40 on stage including an 18-piece big band, DREAM LOVER – THE BOBBY DARIN MUSICAL is a big show with a big score and a big heart. 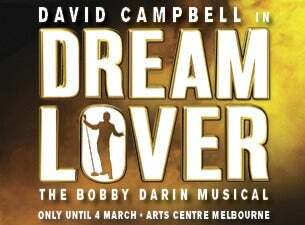 Don’t miss DREAM LOVER - THE BOBBY DARIN MUSICAL: a true story stranger than fiction and far beyond the song.